Attached you will find a compelling article written by my good friend, Rev. Ivan Foster. 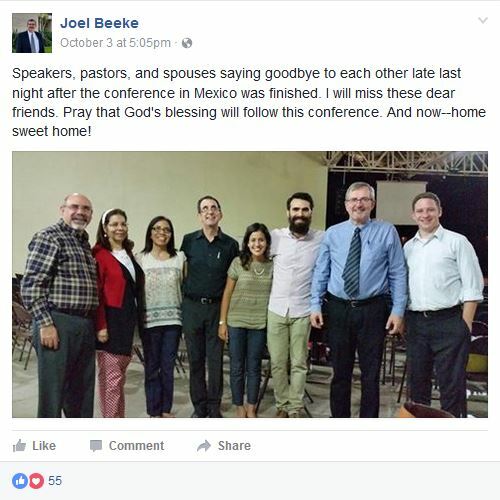 The topic of that article is Dr. Joel Beeke's recent preaching engagements in churches belonging to a Dutch denomination which features at least one self-professed sodomite pastor. Also covered in Rev. Foster's article is Dr. Beeke's expressed ambition to form a permanent link with that same denomination. Over 5-1/2 years ago, Rev. Ivan Foster and I felt called to speak out after Dr. Joel Beeke joined with such scripturally unsound men as John Piper and Francis Chan as one of the speakers at the January 31--February 2, 2011 Desiring God Conference. On a Heart of the Matter program, we expressed our concern that a minister with such a reputation for faithfulness, who has so much influence over such a vast number of evangelicals, would be a part of the Desiring God Conference. We very soon found out that Dr. Beeke is anything but scripturally sound and faithful with regard to his ministries and his ministry practices. And, over the succeeding months and years, we had increasingly set before our eyes undeniable evidence after evidence of Dr. Beeke's absolutely corrupt, unscriptural ministry associations and also the deeply corrupted nature of his ministries, such as Reformation Heritage Books. And so it was that each time Rev. Foster and I breathed a sigh of relief, thinking we had fulfilled our duty to sound a warning on Dr. Beeke, we found ourselves either together or one of us alone writing another article--in truth, another article loaded with undeniable facts which formed the basis of our warnings. I also produced several more Heart of the Matter programs of the same nature, for the same reason. Those articles and links to those programs can be accessed here. Last March, I wrote and published a very comprehensive article titled “The Downward Spiral of Dr. Joel Beeke’s Ministries Continues.” This article contains a summary of previous documentary reports and also specifics concerning Dr. Beeke’s continuing participation in Refo500 and the Evangelical Theological Society with--well, as the summary of the article puts it, "new evangelicals, Romanists, Orthodox ‘Christians,’ Seventh Day Adventists, apostate Protestants, feminists, evolutionists, and even ‘gay Christians.’” I felt, and still feel, that with that last documentary article of many, I have fulfilled what I am sure was a calling from the Lord to sound the warning on Dr. Beeke. Third from left is the woman pastor, Pury Cervantes de Rhinehart. But, enough. Here is a link to Rev. Foster’s article, which is also attached to this e-mail. Also, here are more video clips from the conference: Saturday evening and X Su Palabra Conference.